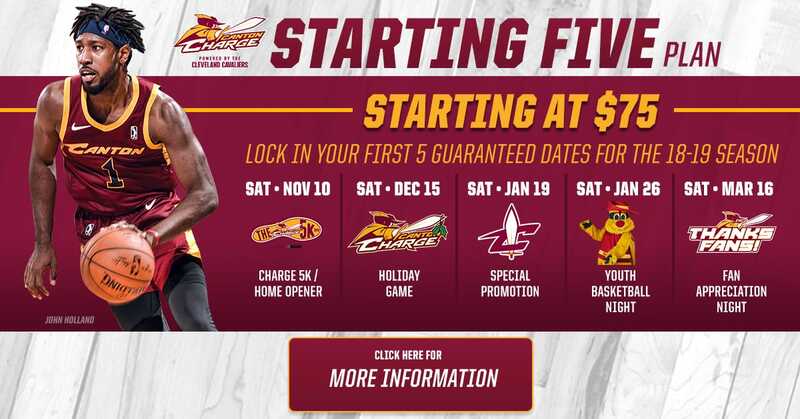 CANTON, OH – The Canton Charge, powered by the Cleveland Cavaliers, today announced a set of six home game dates for the 2018-19 season. In addition to the already available Charge Nation Memberships, the team also announced a new “Starting Five” ticket plan featuring five premium weekend games. The annual Canton Charge 5K presented by LevelWear will help tip off the new season before the home game on Saturday, November 10th. Fans will enjoy a winter wonderland while ringing in the holidays during the Saturday, December 15th home contest. The Saturday, January 19th home matchup will feature one of several Cavs celebrations throughout the season. Area hoopers will fill the Civic Center for Youth Basketball Night and the Charge basketball socks giveaway on Saturday, January 26th. School Day will make its return with a matinee game and educational themes throughout on Wednesday, January 30th. The final early guaranteed date will see the prize-packed Fan Appreciation Night take place on Saturday, March 16th. The “Starting Five” plans with tickets to the five above weekend games are on sale now and start at just $75! “With having some of our biggest games of the year circled on the calendar this early, I know a lot of Charge fans share our excitement and anticipation for our eighth season in Canton,” said Charge Chief Operating Officer Mike Levy. The entirety of the 2018-19 season schedule will be announced at a later date. Group deposits for these six games and full 2018-19 Charge Nation Memberships are on sale NOW! Place your $100 per seat initial payment today to begin all the great benefits of being a Charge Nation Member. Visit CantonCharge.com or call 866-444-1944 to sign up today. The Canton Charge are part of the Cleveland Cavaliers and Quicken Loans Arena organization and are also owned by a group led by Cavaliers Chairman and Quicken Loans Founder and Chairman Dan Gilbert. The group also owns and operates the Cleveland Gladiators of the Arena Football League and the Cleveland Monsters of the American Hockey League, both of which play their games at Quicken Loans Arena in downtown Cleveland.